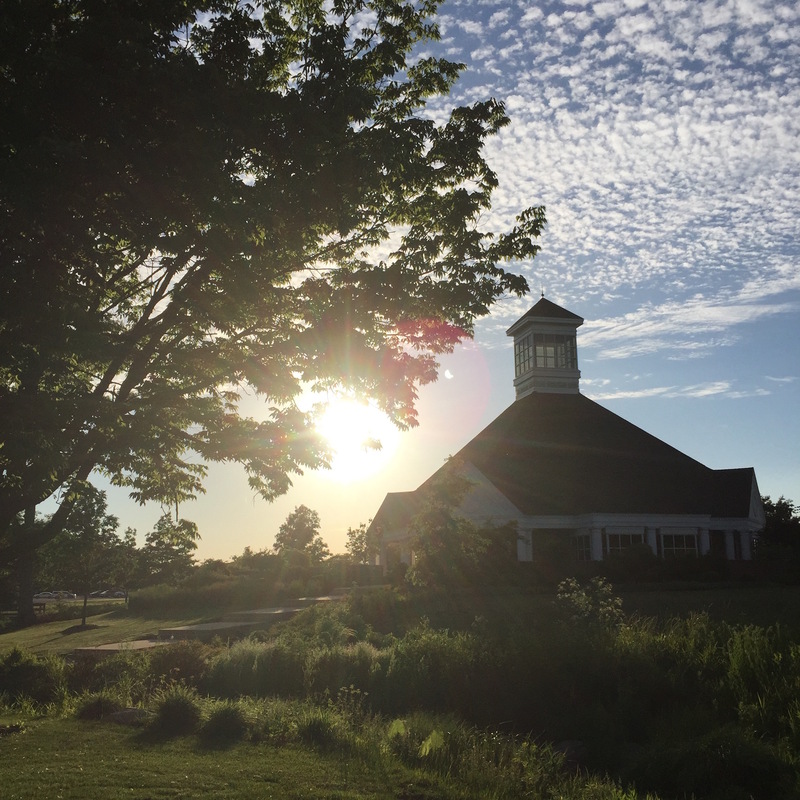 From June 2 to June 5 of 2016, a number of Inklings scholars and enthusiasts gathered in the unassuming Indiana hamlet of Upland to talk about Lewis and his circle, to fellowship in the faith and the arts, to remember old friends and make new ones, and to grow as scholars and as people. Taylor University outdid themselves as hosts of their 10th Frances White Ewbank Colloquium on C.S. Lewis & Friends, and everyone delighted in keynotes from the likes of Sørina Higgins, Colin Duriez, and Diana Glyer. Oh, and Signum was there, too. It started off on Thursday with a warm welcome from conference hosts Joe Ricke and Lisa Ritchie, followed by an afternoon of papers on the friendships of George MacDonald, CS Lewis, and books in general (yes! books are friends!). I especially enjoyed Michael Smith’s presentation on Lewis’s work in the 16th-century volume of O.H.E.L. There was also a presentation honoring the life of David Neuhouser, a very special Taylor U professor who did much to expand the world of Inklings scholarship and appreciation. Anyone at the conference who knew him understood what a precious man he was, and anyone who didn’t get the chance to know him soon realized how much we owe to him nonetheless. 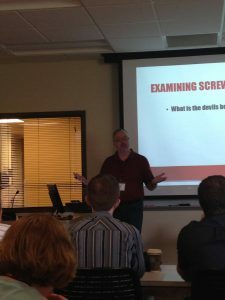 Throughout the conference, his presence was missed and celebrated all at once, and his work gave a deeper meaning to everything the colloquium had to offer. But that was just the beginning. Right before a delicious supper in the dining hall, those who wished to attend crammed into a little room to hear about everyone’s latest publications. Wow. I felt so honoured to be in that tiny space of people brimming with knowledge and wisdom. It was like watching the fellowship of Inklings unfold before my eyes. 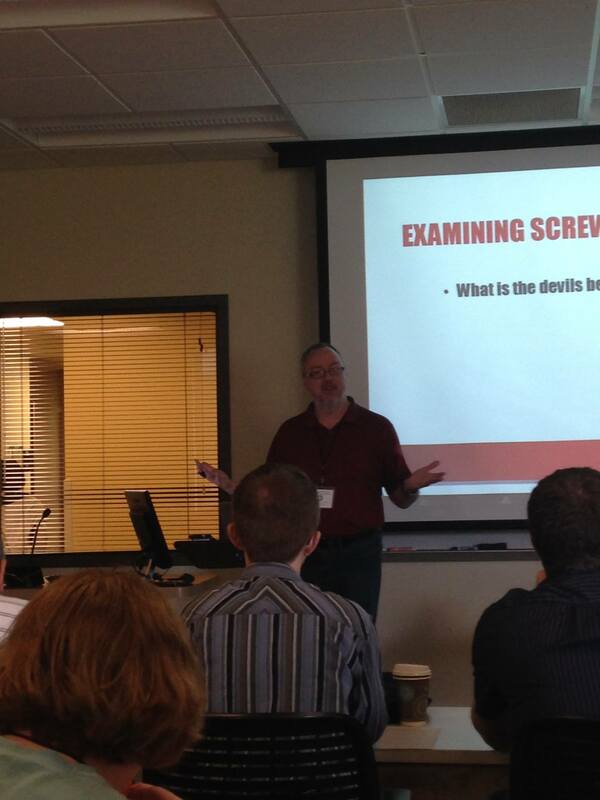 William O’Flaherty would start talking about his latest Screwtape book (check it out!) which would reference Colin Duriez’s recent Bedeviled (buy it!) and that would of course tie into Diana Glyer’s Bandersnatch (so much yes) and Sørina Higgins’s forthcoming Arthurian Index (keep your eyes peeled!) and Zachary Rhone’s soon-to-be-published study highlighting the mythopoeic unity of the Inklings (yeah so I’m excited about that one). And these are just some of the people and books who were present. Memories, jokes, and ideas bounced everywhere. The room was feverish with anticipation and brainstorming, and the short hour flew by far too quickly. Following dinner, the by-now-full conference got to hear Steve Leeper pitch his stop-motion film project, The Temptation of Brother Thomas. His presentation showcases how this year’s colloquium emphasised arts beyond the written word. 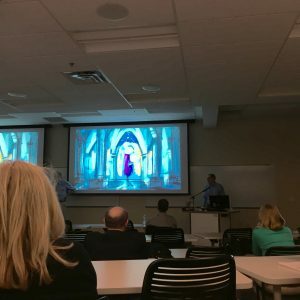 The room was captivated by Steve’s presentation; I know for a fact that I am not the only who got all teary-eyed over the sheer beauty Brother Thomas’s storyboarding had to offer. I can’t imagine how gorgeous the finished film must be. Basically, like it on Facebook. Right after that, Devin Brown gave a talk about his latest work on Mere Christianity, and I’m sure it was amazing based on the engaging personality I soon discovered he was. But after all the excitement and traveling I was way too tired to stay awake, so we will all just have to assume Devin’s talk was spectacular. A creative works open mic closed up the day, and from what I hear the offerings exceeded all expectations, high as they were. Really, I wish I could give you a session-by-session breakdown of how great the 2016 Colloquia was, but the conference was way too full of way too many good things, so I’ll have to skip over a bunch of amazingness so that you and I don’t miss paper deadlines before this review is done (can you tell I’m a grad student?). Sorry. Friday morning held two more rounds of great paper sessions, including work on Lewis’s poetry, Dorothy Sayers, Charles Williams, Lewis’s Space ‘Trilogy’ (Jonathan Swift and CS Lewis all in one paper! ), Neo-Platonism, and the Inklings on science and worldview. I can tell you firsthand that Kat Coffin offered excellent thoughts on the Susan Problem and Charlie Starr pushed scholarship on Lewis’s poetry forward. On top of that, I had the privilege of hearing John MacInnis’s talk on Lewis’s relationship with Wagner’s music, which was…well it was so good I don’t know what to say. I know. You wish you were there. Lunch finished and coffee (tea) slurped, we flooded into the plenary room to hear Prof. Higgins give an intriguing talk about Charles Williams, The Oddest Inkling. 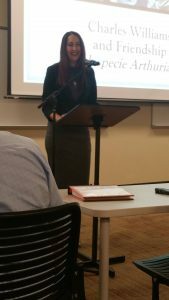 Despite Williams’s sleazy personal life (ahem), Sørina was able to direct us to his interaction with centuries-old Arthuriana, shed some light on his opaque poetry, walk us through his theological works, and situate him as a collaborative author in the Inklings and Modernist circles. Her listeners were rather bedazzled and my first recommendation is to head on over to her blog, The Oddest Inkling, to get a better grasp of the content that stunned us audience members. Sørina also introduced the Taylor Colloquia to Signum, which sparked many a good conversation throughout the rest of the weekend. Friday afternoon brought us more sessions full of Inklings philosophy and poetry, a tour through the Great War of Lewis and Barfield, Tolkien on death and parenting, and so much more. Sub-creation and Till We Have Faces also made their appearances, which means I was a happy camper. Another great dinner done, we all headed to Taylor’s lovely chapel to hear Colin Duriez speak about Owen Barfield. Anthroposophy, Inklings, and dancing – oh my! It was a huge privilege to hear Colin share his insights with us, and tell us a bit more about one of the Inklings who has received less attention over the years. Signum students, you have a rich world to explore with the Inklings. All the scholarship over the past few decades, as inspiring and important as it is, has only scratched the surface. And if you thought the evening couldn’t get any better, Colin’s talk was proceeded by a dramatic reading of George MacDonald’s The Light Princess. Sørina played the cruel aunt and witch, just so you know. I haven’t laughed so hard in a while (and I laugh a lot). The laughter was just getting started, though, as a number of us headed to one of the lounges Lisa Ritchie had so kindly prepared, where we played an uproarious game of Oxford-style Balderdash. There were fake French accents, melodramatic but falsified opening lines, and maybe a Disney song or two involved. Prof. Dickieson won the game (he’s a mean bluffer, I tell you) and the whole evening was worth the late hour. As a student, I benefited greatly from seeing all these smart, accomplished academics let loose and have fun. The same professors and authors who were illustrating the depth and beauty of the minds of the Inklings were also able to relax, to give and take a few good jokes. I hope all of us students end up that way. So sure. Little sleep was involved, but Saturday morning came anyway. And good thing, too, because the papers presented that day were again excellent. We started the morning with a heartening contemplation of prayer from the works of Lewis, and then launched into a whirlwind of dizzying scholarship. To be honest, Saturday was the day I delivered my paper, so my nervous/exhausted memory cannot do the time justice. Somewhere in the midst of all that, Laura Schmidt walked us through what Inklings material are available at the Wade and elsewhere, and how to access them. 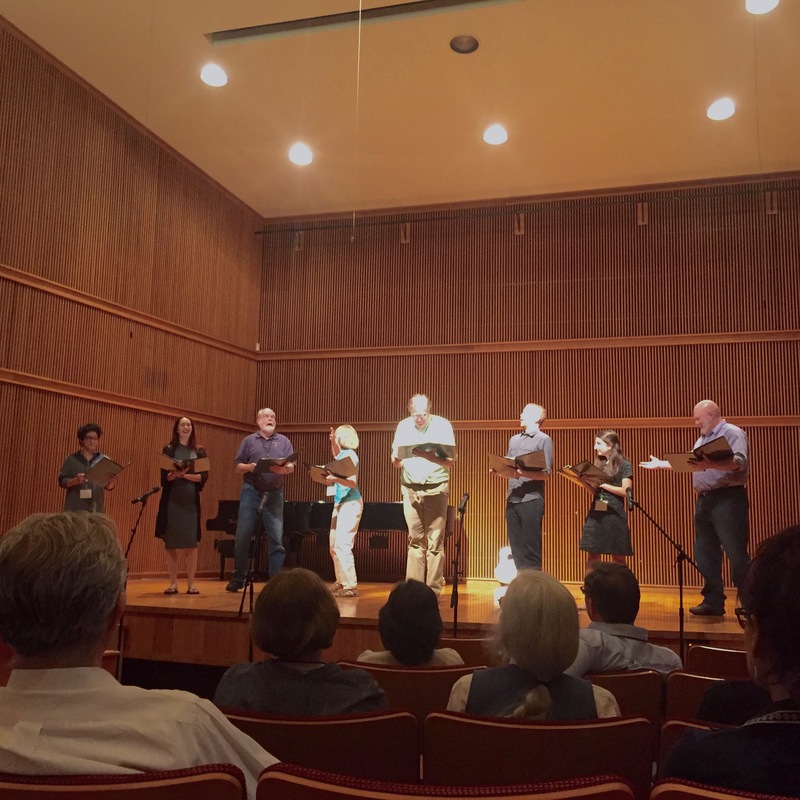 This is just one example of how the Taylor 2016 Colloquium made it a point to help new scholars pursue Inklings studies while encouraging Inklings experts to keep growing in their work. Saturday evening rolled around, which meant it was time to dress up for a scrumptious banquet full of spurring conversation, well-earned awards (congratulations, Kathryne Hall and Luke Wildman), moving tributes, and our final keynote session. It was a little surreal to hear longtime friends of David Neuhouser and Ed Brown speak about these men’s lives and honour their memory. There were tears, yes, but there was a deeper sense of Joy (Lewis, again!) that these lives were so well-lived and would continue to bless generations to come. A student performed an original cello composition, which struck perfectly the harmony of mourning and gladness that pervaded this time. Very Tolkien, indeed. Then Diana Glyer stepped up to the podium and led us in a participatory exercise: discovering whether our creative process was more like Lewis or more like Tolkien. Her talk proved eye-opening and great fun. Scattered amidst Inklings stories and trivia, Diana helped each of us learn how we work best as sub-creators. I doubt that anyone’s sub-creative and teaching methods were left untouched. It was the perfect way to end the evening. Except the evening wasn’t over! 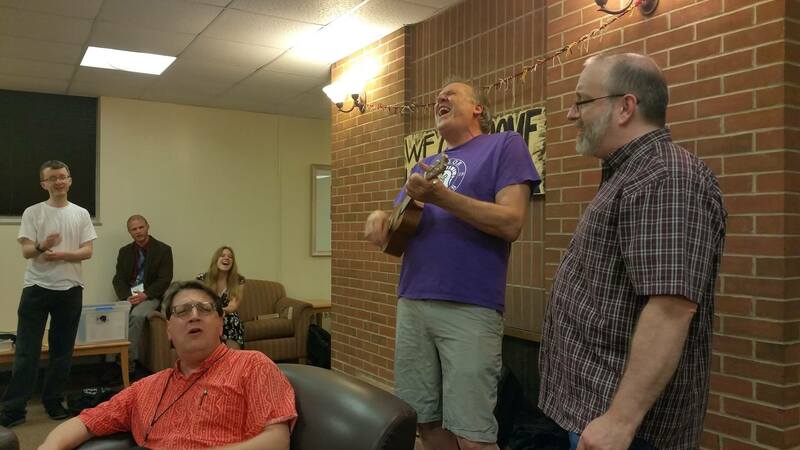 While conference attendees were given the freedom to scatter, converse, and rest, a majority of us huddled in the lounge again to sing and laugh and dance. 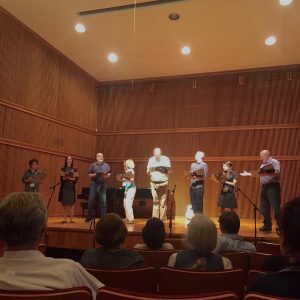 From ‘Molly Malone’ to ‘Fire and Rain’ to ‘Be Thou My Vision,’ a horde of Inklings scholars and a haphazard but decidedly folk conglomeration of instruments played music into the wee hours of the morning. We couldn’t have had a better time. I think this sort of camaraderie was just as important to the Inklings as any textual critique ever was. It was a sight and blessing to behold. Sunday morning came even sooner than Saturday morning had done, but many of us were able to enjoy morning prayer together before heading over to the dining hall for an extended breakfast where we all talked about the future of Inklings studies and bounced around collaborative project ideas. I was deeply impacted by the humility even the most respected scholars showed and how eager they all were to enable the next generation to continue their work. I think everyone left that mess hall buzzing with ideas and feeling a refreshment and renewal that could not be done away by any lack of sleep. And that was that! Airports were reached, road trips were completed, and now everyone is home again. But we’re different now, in all the best ways. If you ever get a chance to attend a Taylor Lewis Colloquium, you really should. And no matter where you are or where you go, just know that the Inklings world is full of amazing people. Get involved! And never stop going further up and further in. See you again in a few years, you lovely Taylor campus you!